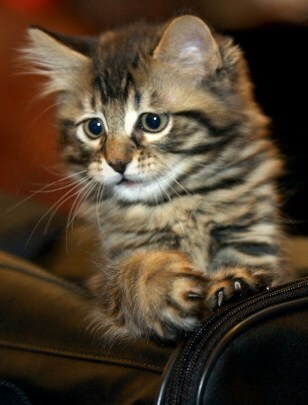 Woman pays $50,000 to firm for genetic twin of beloved cat;Little Nicky considered the first cloned-to-order pet sold in U.S.
Nine-week-old "Little Nicky" peers out from her carrying case in Texas. Little Nicky, a cloned cat. was sold to its new owner by Genetic Savings and Clone for $50,000.